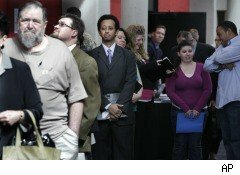 A mixed-bag week on the employment front: Initial jobless claims were higher than expected, although they dipped 3,000 to 456,000 for the week ending June 5, while continuing claims fell 255,000 to 4.462 million -- their lowest total in 18 months, the Labor Dept. announced Thursday. A Bloomberg survey had expected initial jobless claims to fall to 448,000. Meanwhile, the more telling four-week moving average -- which smooths out anomalies for holidays, strikes etc. -- increased 2,500 to 463,000. Jobless claims need to drop below 400,000 during the next two quarters to give economists and investors confidence that commercial activity is increasing at a pace that prompts companies to curtail lay offs and resume hiring. States also reported 4.99 million persons claiming Emergency Unemployment Compensation benefits for the week ending May 22, the latest week for which data is available, a decrease of 10,588 from the prior week. The highest insured unemployment rates in the week ending May 22, the latest week for which data is available, were in: Puerto Rico, 6.2%; Alaska, 5.5%; Oregon, 5.3%; California, 4.8%; and Nevada, 4.7%.